The tournament was initiated by the teachers who attended the Just Play training workshop conducted by the Solomon Islands Football Federation (SIFF) special projects office in the area in June. After completing the 6-week implementation of Just Play training program in their schools, the teachers decided to organise the tournament to reinforce the goals of the program with their students. Six (6) schools took part in the event with each registering a boys and a girls team. The tournament was played in 2 categories with 6 teams each. A total of 150 children (90 boys and 60 girls) took part in the event which was hosted at Nguvia sports ground. The schools that took part were Belaha Primary School, Ngalibiu Primary School, Nguvia Primary School, Tau Primary School, Kamau Primary School and Gaobata Primary School. The competition was played in the round robin format with each team playing 5 games each. Ngalibiu Primary School won the boys category after finishing on top of the competition ladder. The top spot in the girls category went to Nguvia Primary School. The winners were awarded trophies and were given an invitation to represent Guadalcanal at the youth talent identification program currently being run by SIFF. The tournament was initially proposed in June by the president of the Guadalcanal Football Association (GFA), Patrick Miniti at the closing ceremony of the Just Play workshop. In his speech at the ceremony Miniti announced that he will be working with the Just Play schools to organise a football festival program after they have completed their individual implementation schedules. Miniti then liaised with SIFF to support the event and later assisted with the overall coordination of the event. Miniti states that the successful end of the program is a testament to the commitment of the schools in the area to football and he is happy to have worked with the teachers in delivering this opportunity for the children to display what they have learned from the 6-week Just Play program. “There were challenges that we had to overcome but in the end the atmosphere created by the excitement of the kids to play football made it all seem like a joy. I thank all the schools and the teachers for coming together to organise this event, it is a model that I hope to implement in other areas on Guadalcanal,” Miniti says. The finals were witnessed by officials from the SIFF special projects office led by the Phillip Ohoto’ona who described the tournament as a well managed community initiative. Ohoto’ona says that the highlight of the event has been the ability of teachers in collaboration with GFA in initiating and managing an event that caters to the needs of the children in their communities. “I am proud to see that Just Play has been able to influence something positive in the communities here. This event is not only about football but it is also about interaction and exchange and from what I’ve seen over the 2 days of the tournament I can say that football and Just Play have a bright future here,” Ohoto’ona says. SIFF’s donation to the event consisted of 2 trophies, equipment (balls, bibs and markers) and $2500 in cash. The cash donation met areas like venue preparation, transportation and match administration. Each school that participated where also given Just Play equipment to take back with them after the tournament. A similar festival will be organised for Honiara schools in the second week of November to wrap up the 6-week implementation program for the capital that is scheduled to kick off on Monday 3rd October, 2011. The event will be hosted at the SIFF academy grounds. The Just Play program is funded by the Australian Government. It encompasses the dual aim of promoting healthy lifestyles through sports and community education. The program is managed by the Oceania Football Confederation (OFC) social responsibility department headed by Franck Castillo. 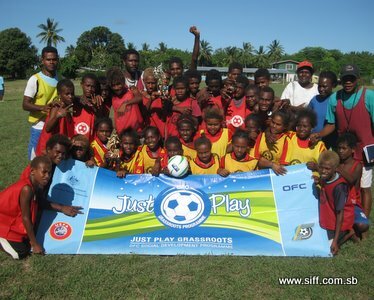 Just Play in Solomon Islands is managed through the SIFF special projects office, a special department set up to manage externally funded projects that are run under the auspices of SIFF.